6-19 overall. 2-12 in the MIAA. Several players dismissed from the program. A year to be forgotten. 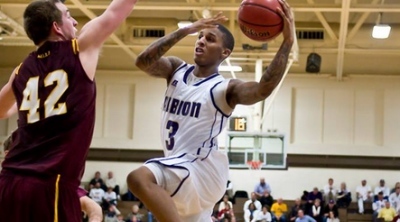 But that was last season for the Albion College men’s basketball team (11-7 overall, 5-2 MIAA). This year’s team is different. Youth is often what holds talented teams back, but the Britons are an experienced young team and find themselves sitting in third place as they head into the second half of the MIAA season. While the team has found a level of consistency, it’s still not always easy to go out and practice hard every day. According to Ridgell, it’s up to him, captain Zach Hurth, Lansing junior, and the other upperclassmen on the team to continue to push the younger guys to get better even when times are tough. So far, they’ve been able to do a very good job managing the emotions of their young team. Coach May had similar praises about the realm of support the team has received since students returned to campus. “It’s a great thing,” he said. “I hope this is a positive step for athletics in general because I think a lot of the other athletes on other teams were at our games. From large cut-outs of junior forward Carter Elliot’s head, to dancing non-stop in the front row during timeouts, the students have helped change the atmosphere for a team that started the year trying to find a new identity. With last year now long gone and a noticeable change in the mindset of this year’s team, the Brits look to close the second half of league play strong and finish with an MIAA championship.